This is another poem from Il y a which was originally printed as something of a calligramme. 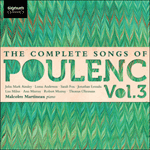 Like Montparnasse the song was subject to ‘long polishing’, as Poulenc puts it in JdmM: ‘I found in 1944, at Noizay the music for the line “Qui vient de loin qui va si loin”, in 1945, at Larche (Corrèze) “Et passe sous le pont léger de vos paroles” … I worked again at the whole song in May 1946 and finished it at one go in Normandy in July, during a spell of rehearsing with Bernac … The day, and that day only, when I solved the problem of expressing intelligibly the formidably difficult “c’est pour toi seule que le sang coule” (bars 18–21) I ventured to write this song.’ In fact this delightful piece of gently running water-music is one of Poulenc’s most skilful (and lesser-known) songs. The piano-writing in this marvellously stitched-together patchwork of happily conjoined phrases is limpidly economic, the tempo an even and commodious one-in-a-bar, the conversation on opposite sides of the river bank without stress or undue haste. The composer dedicated the song to the memory of the writer Raymond Radiguet, whom Poulenc associates with the Cocteau set and golden days in his teens spent at his grandparents’ home on the banks of the Marne; valses-musettes something like this could be heard in the working-class dance halls and funfairs along the river bank and instantly became part of the composer’s musical vocabulary. Un poème appears in Il y a opposite Le pont. The brevity of the poem as well as its mystery encouraged the composer to write a single-page musical exercise in avant-garde atonal style—dedicated, appropriately, to the composer Luigi Dallapiccola. The poet that comes to mind here is surely James Joyce, whose Solitary Hotel from Ulysses (much later set to music by Samuel Barber) paints a similarly mysterious scenario. 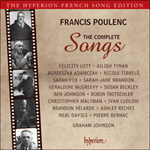 If Poulenc was discreetly making fun of atonality (the final voluptuous C major chord seems positively provocative in that regard) he said nothing that might imply that this song, the size of a postage stamp as he put it, should be sung with anything other than great seriousness. He wrote that he sought to evoke in this music ‘a great silence and a great emptiness’. Apart, that is, from the moment when the match memorably sparks into flame.